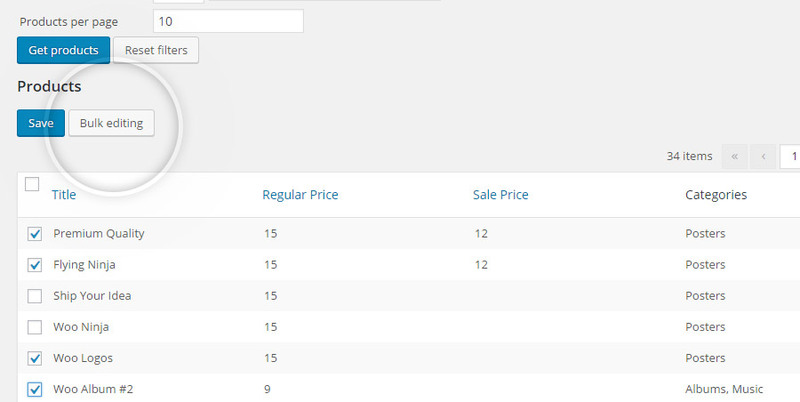 The free version of the plugin lets you change the price of different products of the shop at the same time. 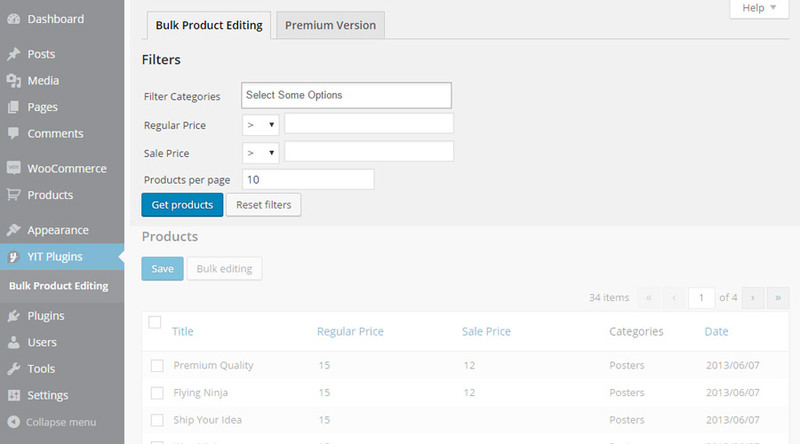 Click on the Bulk Product Editing entry in YIT Plugins tab to go to the settings panel of the plugin. Note: the plugin doesn’t let you change variable products. In this page you find the products list of your shop. By default, the plugin doesn’t apply any filter to this list and allows to show them 10 at a time. However, these settings can be changed through the options you find in “Filters” section. Thanks to them you could filter the products list by price and category. After applying the filters, click on “Get products” button to obtain the products list to change. Price editing can be applied to single products, or at the same time on different elements of the shop. 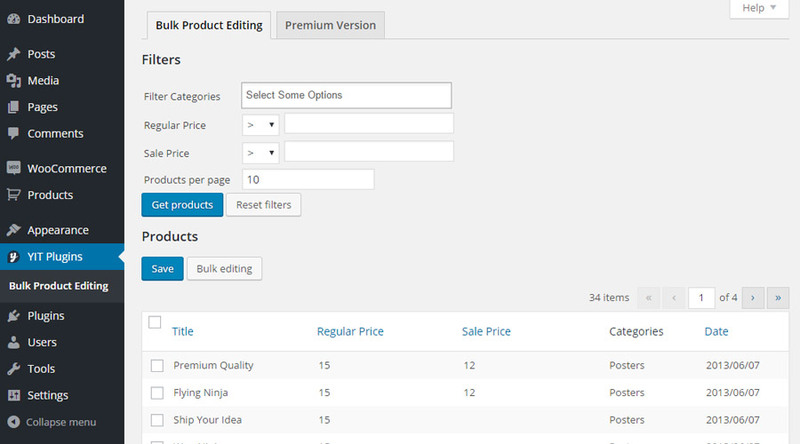 To edit a single product, you just have to click on the price, the regular one or the sale one, of the price you want to edit and write the new value. For each modification, the correlated field will be colored to highlight the different value. 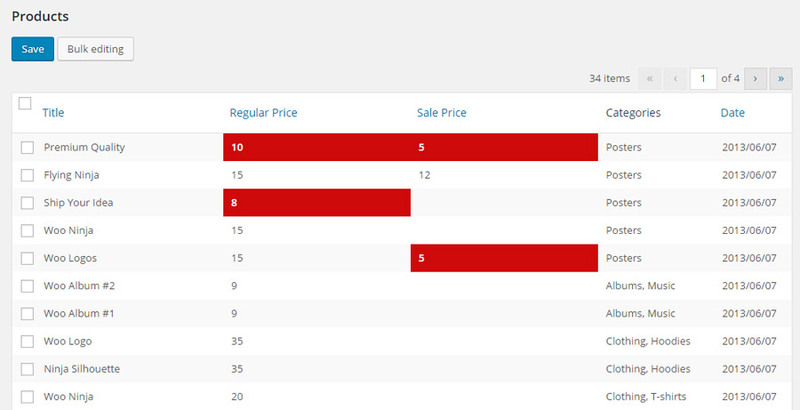 If you have changed the price on different products, you will see something like the following screen. Click on the “Save” button to save your editing. 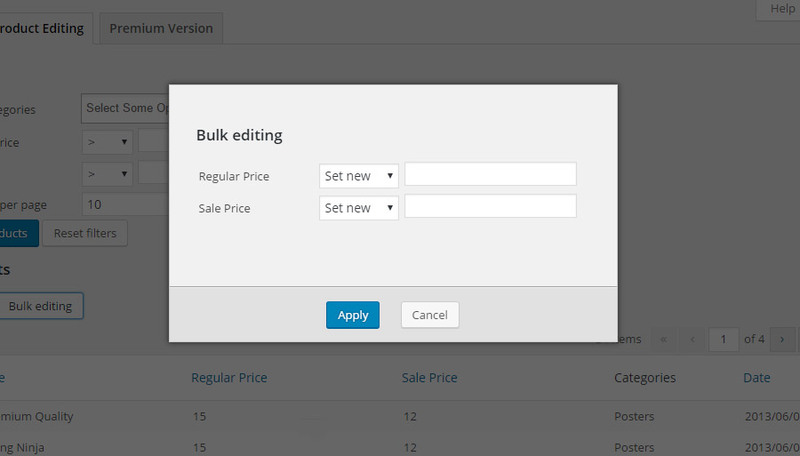 For “bulk editing”, Select all products of the list you want to change and click on the “Bulk Editing” button. Now a popup will be opened, and you will be free to change the regular or sale price for all products. The editing is just one, and it applies to all selected elements. Now click on the “Apply” button, and all modified fields will become red. Click on the “Save” button to complete the editing process.